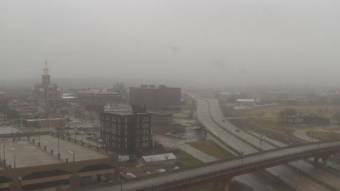 It's 08:33 in Dubuque, USA right now. Hotel Julien A webcam in Dubuque, Iowa - camera location: Hotel Julien. East Dubuque, Illinois: Riverview Terrace, 1.2 miles away. Freeport, Illinois: City View, 55 miles away. Iowa City, Iowa: Iowa Old Capitol Building, 73.1 miles away. Coralville, Iowa: Iowa River Landing, 74 miles away. Madison, Wisconsin: Constellation Building, 74.9 miles away. Beloit, Wisconsin: McNeel Middle School, 83.2 miles away. Beloit, Wisconsin: Aldrich Middle School, 83.2 miles away. Waterloo, Iowa: Cedar Valley Tech Works, 85.5 miles away.